Cafes are the ideal place to sketch especially over coffee and something nice to eat. Here are a few of my favourite cafe sketches done in the last few months in Singapore. Pique Nique in the JCube Mall in Jurong East in Singapore was particularly well patronized the day after the Jem Mall next door was closed due to a collapsed ceiling in one area. This was caused by an accumulation of water after an unusually wet spell. They sell good coffee and particularly nice macarons. These little treats have really taken off (I think) world-wide. A macaron is composed of two almond meringue discs filled with a layer of buttercream or jam. (Not to be confused with macaroons). The coffee at Pique Nique came with a face of a Mandarin drawn in the foam. The table we sat at on another occasion at the same cafe allowed us to watch people waiting to catch the shuttle bus to the nearby IMM Mall (Singapore is a city of malls). Unfortunately the people in line were just a little too close for comfort. 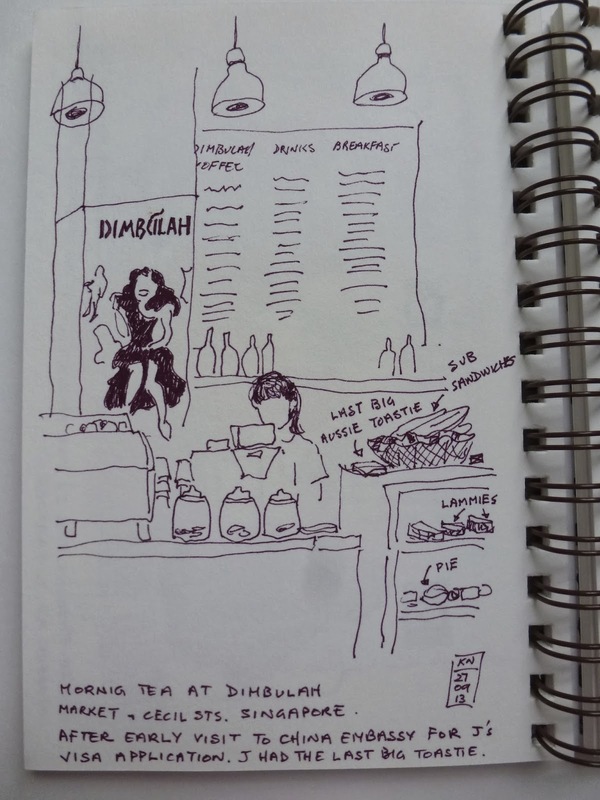 Dimbulah is a cafe in Raffles Place, the business district of Singapore. Named after the town of Dimbulah in North Queensland, Australia and catering mainly to the expatriate community who work in the area, they sell meat pies, sub sandwiches, Lamingtons (see below for what these are), muffins and cakes. My Australian husband just had to have their last Big Aussie Toastie! A Lamington is a cake of Australian and New Zealand origin. It consists of 2 squares of sponge cake sandwiched with cream and coated in chocolate icing and then dessicated coconut. A strawberry version is also popular. Commonly sold in bakeries and often used as fund raisers for schools in Australia and New Zealand, it is unusual to find them for sale in upmarket cafes. I never heard of macarons before. Is the "n" pronounced as in English or tacked on to the "o" as a nasalization, sort of Frenchified? We pronounce the "n" as in English. They're just everywhere in Sydney, Taipei and Singapore. Not good for Sherman but I will try to sneak a bite--they sound like a delicious amuse-bouche.